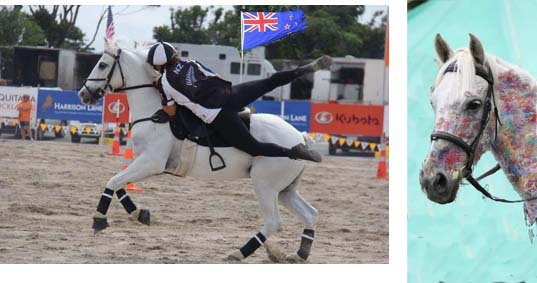 The main painting is of the horse and rider (photo labelled “main photos.jpg”), but we would like the shirt to be the same as on the other photo (labelled “symbol and letters on back of shirt.jpg”) and the colours of the green and white flag on the right to be replaced with the pattern and colours of the flag in the other photos (labelled “Flag colours to replace green and white flag on the right”). The real horse’s head to be painted onto the body of one of the coloured horses. So, the picture would only have ONE horse in it – with the colours of the two horses but the head of the one in the photo. The colours would merge from the body into the head.